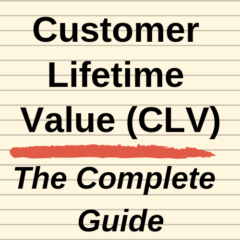 This is an excellent research paper, ideal for anyone seeking a more detailed understanding of customer equity and customer lifetime value. The paper also provides good insight into the airline industry in India, as one of the co-authors is employed in the industry. The paper constructs a framework for the integration of marketing strategy with customer lifetime value and customer equity within the airline industry. It has a significant return on marketing investment focus. For a better understanding of the case study, here two paragraphs from the abstract of the research paper. The authors present a practical model that can be of help to airline managers to trade off competing marketing initiatives and make them accountable. The model enables airlines to calculate ROI for any prospective marketing investment and to evaluate the realized ROI. The framework is based on the effect of marketing initiatives on firm’s customer equity, which is the sum of lifetime values of airline’s current and future customers. Each customer’s lifetime value results from the frequency of flying, average price of ticket, and brand switching pattern, combined with the firm’s contribution margin. The drivers of customer equity include value (quality, price, convenience), brand (brand image, brand awareness) and relationship (loyalty program, CRM, knowledge of passenger). Airlines may analyze drivers that have the greatest impact, compare performance on those drivers with that of competitors, and project ROI from improvements in those drivers. The framework enables “what-if” evaluation of marketing ROI, which can include such criteria as return on service quality, return on advertising, return on loyalty programs, and even return on corporate citizenship, given a particular shift in customer perceptions. This enables the firm to focus marketing efforts on strategic improvements generating the greatest return. Return on marketing investment: A Case Study of the Domestic Airline Industry in India by Dr. S C Bansal (Associate Professor at the Indian Institute of Management), Dr. Mohammed Naved Khan (Senior Lecturer Department of Business Administration Faculty of Management Studies & Research Aligarh Muslim University Aligarh) and Dr Vippan Raj Dutt (Manager, System/Maintenance, IT Department at Indian Airlines Limited. And you can also download their supporting PowerPoint presentation here IIMA-ROMI_Presentation, which was presented at the “Return on Marketing Investments” conference jointly conducted by the Indian Institute of Management, Ahmedabad and Zyman Institute of Brand Science at Goizueta Business School, Emory University.